At Brasso Nissan, we strive for far more than a simple business transaction. We want to earn your trust and to make choosing us again and again the easiest and most comfortable choice you have available and… we’re proud to say it’s working! 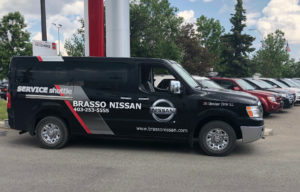 These milestone awards and achievements are proof positive that Brasso Nissan is doing something unique that our clients appreciate and come back for year after year, and we remain fiercely proud of them. • In 2004, we were honoured to receive the prestigious “Ethics Award” presented by the Southern Alberta Better Business Bureau. This was the first time the award had ever been presented to an automotive dealer. A core philosophy at Brasso is to provide unsurpassed value for your hard-earned dollar. That’s why we offer value-added services to all our clients at a minimal or no additional charge. The common theme with the services listed below is that they will save you both time and money…lots of it! • Door-to-door shuttle service – throughout southeast and Downtown Calgary. • No-Charge Service Loaners – Simply book a loaner when you schedule a service appointment. You pay only for the gas you use (not available for oil changes and tire rotations). • Express Service while you wait – Expert technicians perform oil changes and tire rotations in less than one hour. • Off-season tire storage – Best value pricing of only $59.95 per season! • Complimentary car wash with every service appointment – during temperatures of -5 degrees and above, and upon request with Express Service due to the additional time required. • Relevant Only E-communications – Service Reminders, sales specials and a monthly newsletter with valuable discounts. No aggressive solicitations! • Car Care Clinic – Brasso hosts a complimentary monthly Clinic where our experts discuss the benefits of regular maintenance, the Nissan warranty, detailing techniques and the operations of your vehicle. ALL of our clients are welcome, not just those who recently made purchases, so please come and enjoy a fun, community event and learn more about how to get the most out of your Nissan! Customers can also expect transparency from Brasso, in every department, in all our business dealings. Period. Our friendly, knowledgeable sales staff are all trained in a unique, “No-pressure” style so that you can actually enjoy the excitement of purchasing a new vehicle – the way it’s supposed to be! Finally, we understand that automotive dealerships often sound exactly the same, stating “we’re willing to go further than the other guys” or “we represent the best value” and all the usual clichés. That’s fine. The proof is in the pudding as they say, and we deliver on those promises. And we appreciate you giving us the opportunity to prove it!